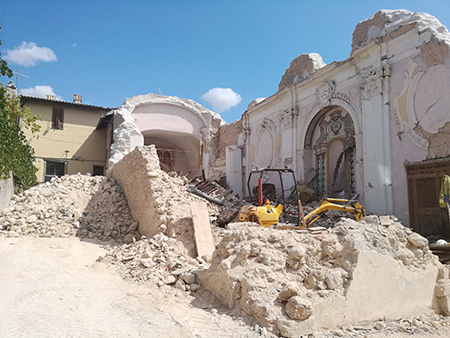 EPICentre PhD student Valentina Putrino, with mentorship from Prof D'Ayala, has been awarded the EEFIT Research Grant for the project "Cumulative damage assessment and strengthening efficiency of masonry buildings in Norcia affected by the 2016 seismic events in Central Italy". This is one of the two grants that EEFIT awards each year to support short-term projects that will benefit earthquake (and related hazards) disaster mitigation and post-disaster reconnaissance efforts.The project will make use of the previous findings of the October 2016 EEFIT Reconnaissance Mission in Central Italy sponsored by NERC, with the main aim of investigating the extent of cumulative damage caused by the following swarm of seismic events which struck the historic city centre of Norcia and its surroundings. Chiesa di San Salvatore, Norcia. The outcomes of the proposed project will help to enhance the existing literature on fragility functions used to evaluate the seismic performance in historic urban centres in Italy. The study of the efficacy of different strengthening solutions will enrich the current debate and support the amendment of current prescriptions of the Italian seismic code and other national and international codes. Valentina has been on site in September 2017, gathering data with the help of PhD student Chen Huang. The project is carried out in collaboration with the University of Perugia, which supported the field investigation in Norcia and its surrounding area..ARUP has also expressed interest in the research topic and its future outcomes.The outcomes of the project will be published in a report and also presented at Institution of Structural Engineers. Details will be following soon.